I had a further play with the Creative Palette with acrylic paint the other day, and my results, no matter what I tried, were equally disappointing. I tried a prussian blue chalk ink on it, thinking inks might work, but it stained the circle very BLUE and nothing I did would remove it. I stuffed it in the sleeve and on the shelf and decided that I would waste no more time with it. I was going to blog all the things I tried but then I thought Why bother? I’ve already said it was an epic FAIL for me and nothing I said was going to expand on that. But then an odd thing happened – I turned on the TV at just about 6 pm, ready to set up a recording for DD and the TV happened to be on Create & Craft. Odd, cause I haven’t watched it for DAYS. In the seconds before it went off the air on Freeview I noticed mention of CREATIVE PALETTE! I went to the website to watch the show, which had been on at 3 PM, I think, and watched the bit where the guest demoed the CP with Crafter’s Ink re-inkers. Crafter’s ink is just pigment ink that can be heat set and becomes permanent. A dim memory surfaced. I had a handful of little bottles of pigment ink re-inkers that I swear I bought 20 years ago, most of them had never been opened. I dragged them out and sat down to have a play. One thing the guest mentioned was that she brayers on some hand sanitizer first, then adds the pigment ink. I did do that for the first few ones, but to be honest in the end I mostly skipped that step – the pigment ink stays wet enough without it. 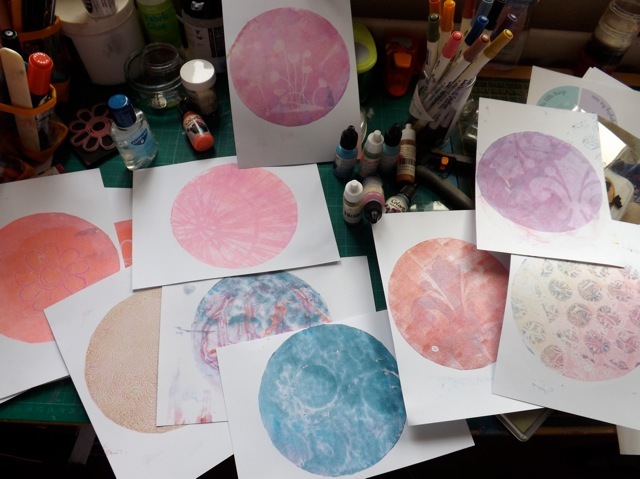 That is a couple of colours, with one of my Gelli Plate anaglypta wallpaper samples pressed in to it then the print pulled. Very Gelli plate like! But with pigment ink not paint. Softer, chalkier. Pretty. But worth the effort? Maybe. This was a big, rubber background stamp. The tone-on-tone look is OK, I just wonder how worth it it is. Could I get close enough to a similar effect by just stamping? Still it was mildly interesting. A MUCH thiner layer of ink now, but I didn’t clean off the blue. I really liked that one. 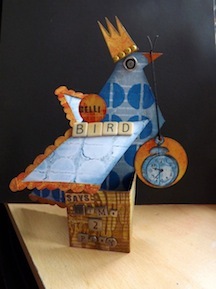 And this one – more blue over the top, big bubble wrap, and you can still see the foam stamp impression. One of my favourites for sure. 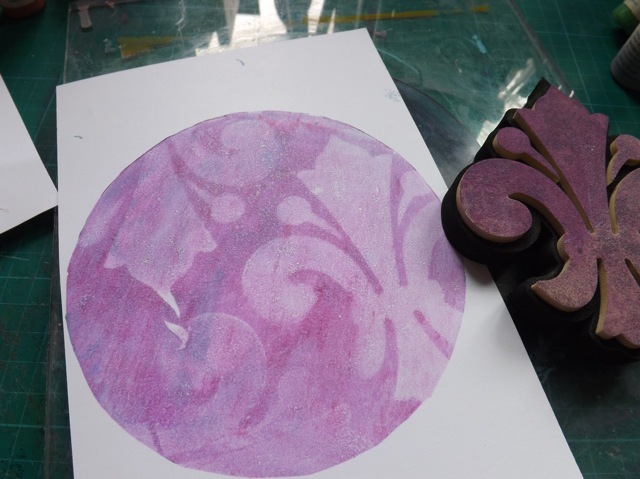 Another foam stamp cut from one of the Die Delights. 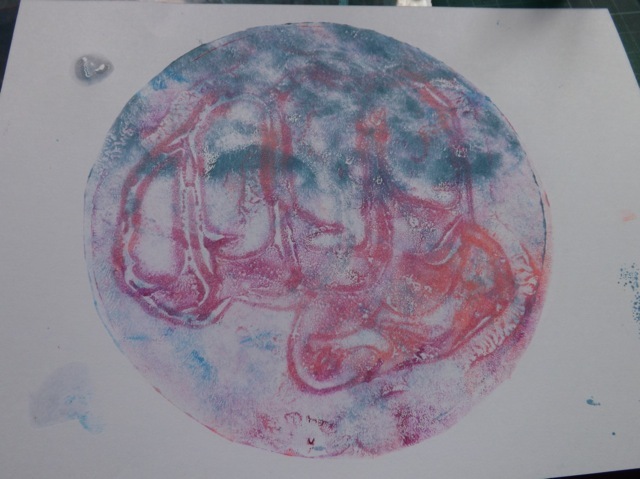 Keeping the brayer in position gave me a rainbow effect when I brayers the ink on. It is a bit more vibrant than it looks here. Again, the photo doesn’t do it justice, but why not just brayer the ink onto paper then over-stamp? The palette really doesn’t ADD anything to the process, except for a slight more…atmospheric look, I guess. I then HAD to try a stencil. I still felt that HAND CUT (so much thinner) stencils would give a better impression and they did, but still not what I would call sharp and defined. And that one was REALLY cool. Some maybe worth keeping (probably great for ATC backgrounds) but I am still not convinced this is something I am going to do a lot of. Oh, I just noticed – that single foam stamp towards the right? Between the blue and bubble one? Fo THAT one I simply pressed and small pigment ink pad onto the palette. The pattern of small overlapping squares was neat, and def worth playing with. 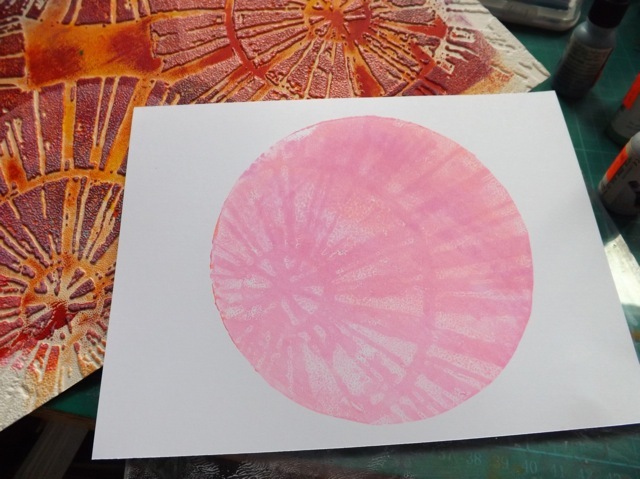 you can brayer on or press on an ink pad rather than droplets from re-inkers but you will get a lighter colour. AND if pressing on use ONE colour or yo will cross contaminate your ink pads. 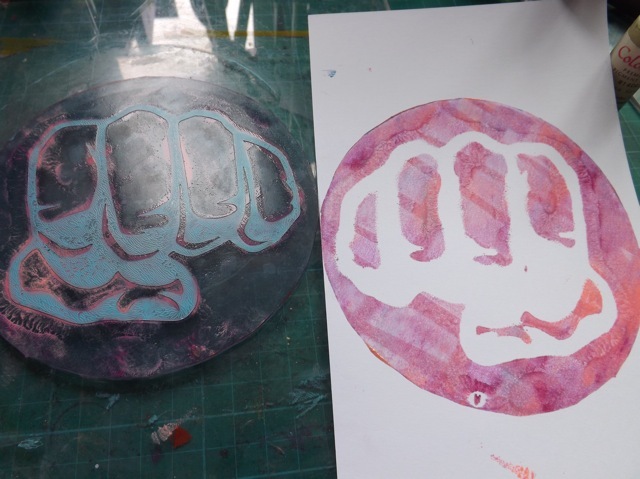 stencils are best f ones yo cut from thin material – so far. I really need to try a thick one again at some point to be sure. 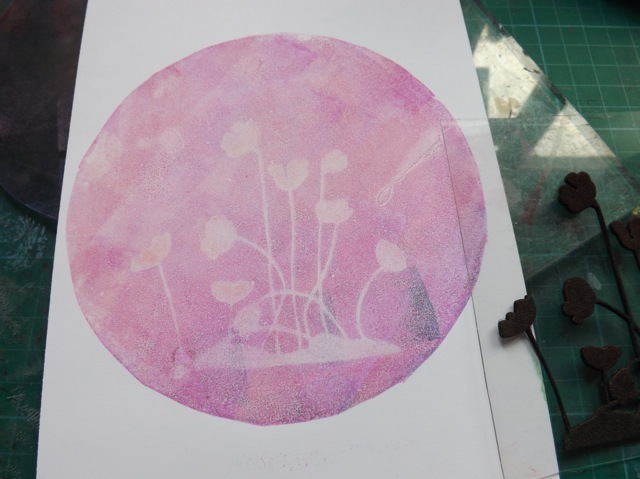 do press whatever you used to REMOVE the ink back onto a print or even onto the ink on the plate. Those are def. my favourite effects. 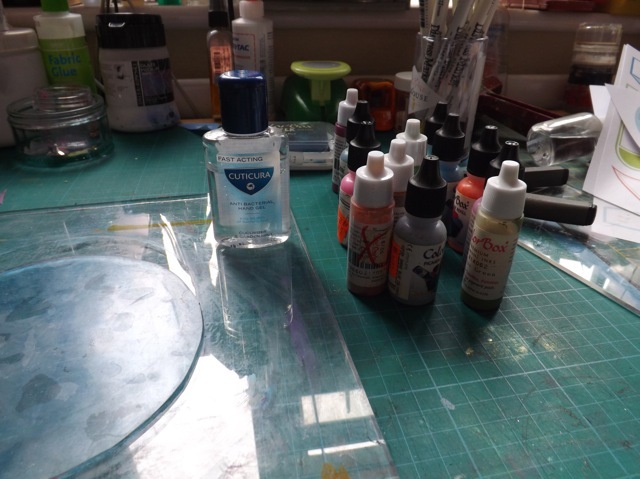 acrylic paint is CHEAP – I don’t think re-inkers are. 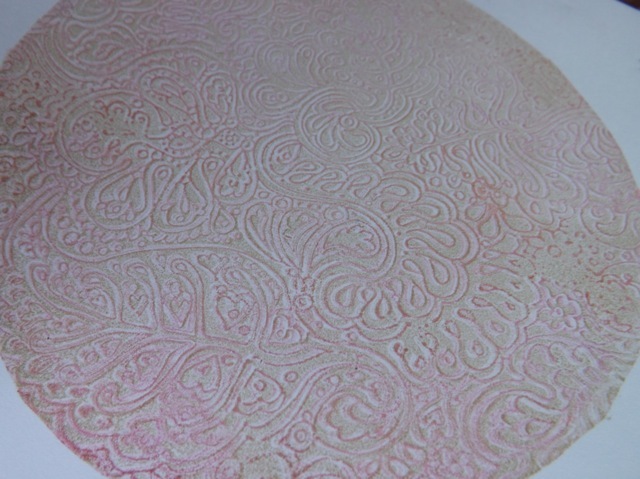 One BIG warning is keep in mind pigment inks dry super slow – that’s their benefit for embossing, for example. 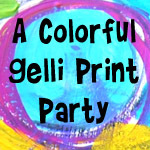 But you have to put the prints aside to completely dry for a LOT longer than you would do with a print from paint on the Gelli plate. 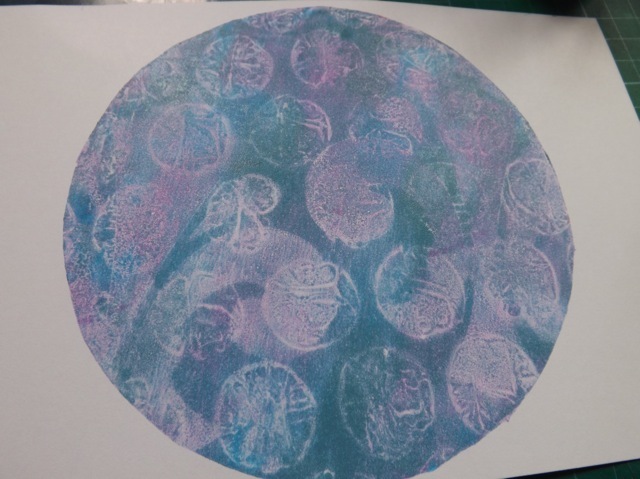 I might try Distress ink at some point, but as the Chalk ink so badly stained my plate (but made NO DIFFERENCE and did NOT transfer to future prints) I’m kinda afraid it might end up brown and opaque at some point if I carry on. The jury is still out on this, for me. 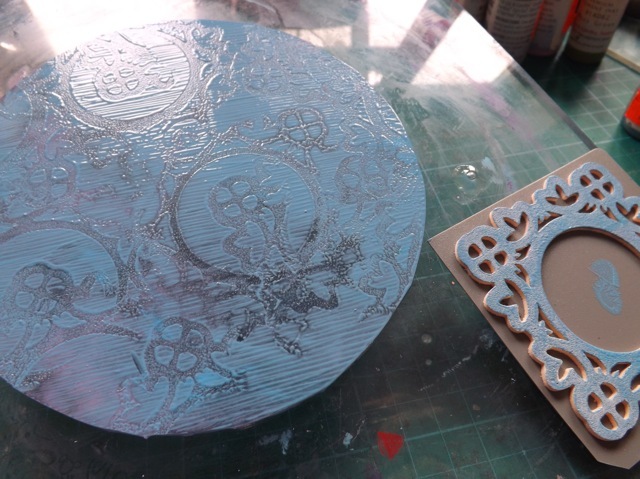 Except on one point – do NOT buy this thinking it will work anything LIKE a Gelli Plate. It doesn’t. 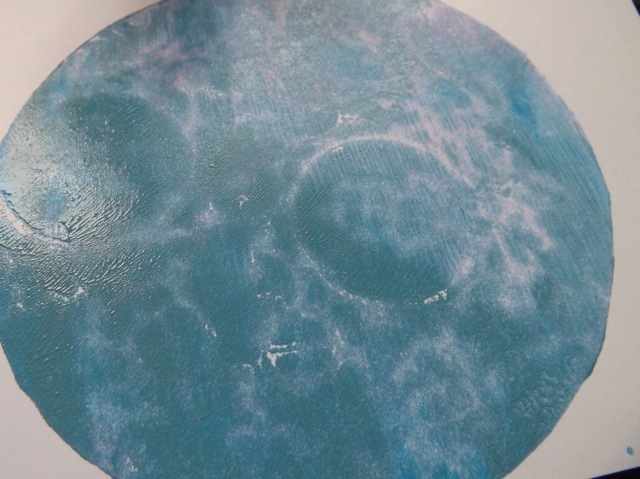 Well, maybe if you take the added step (and expense) of adding Flow Medium to every application of paint, it might, but I just don’t see the point when a Gelli plate doesn’t need that and works for paint better. But at this point I can’t say the Creative Palette is a TOTAL FAIL. That’s as far as I am willing to go at this point LOL! Categories: inks, reviews | Tags: inks, product review | Permalink. Thanks for both of your reviews on the Creative palette. I saw the Creative palette on Amazon and I was intrigued by it. On Amazon it only had bad reviews, but I still wanted to know more information about the product. 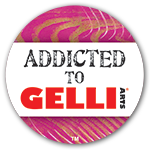 I very much appreciate your reviews (with pictures) and the comparison between the palette and the gelli plate. Thanks! 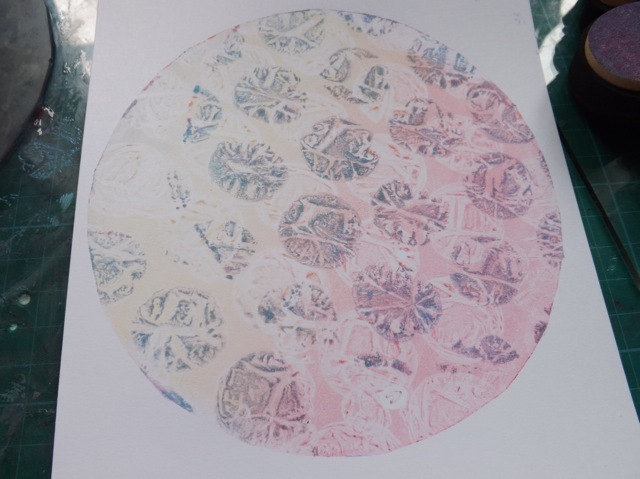 Also after reading this I wondered if you might be able to make prints with gouache. I know Lindsay the frugal crafter has a video on how she makes her own pigment ink refills with an inexpensive set of student grade gouache paint. I wonder, if you use just the paint to print, would work and be a cheaper alternative to the refills? I don’t know. ..
you might write to the manufacturer and tell them how disappointed you were with it, maybe they can give you some hints or a rebate. Maybe you got a bad plate also. Wonderful – thank you for sharing with all the great photos.